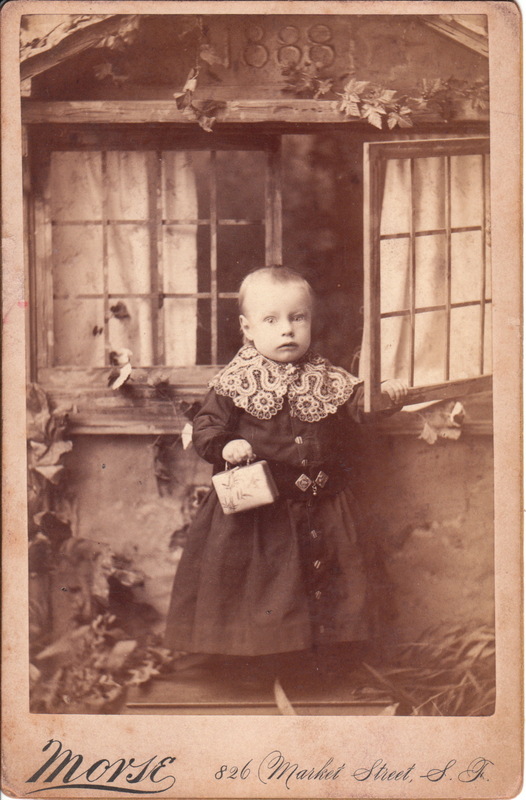 A very young child, holding a box by the handle, poses for his portrait at the Morse Studio in San Francisco, California. The child is standing in front of a small house. The faux house is a studio prop. Note that that the number “1888” is above the open window. 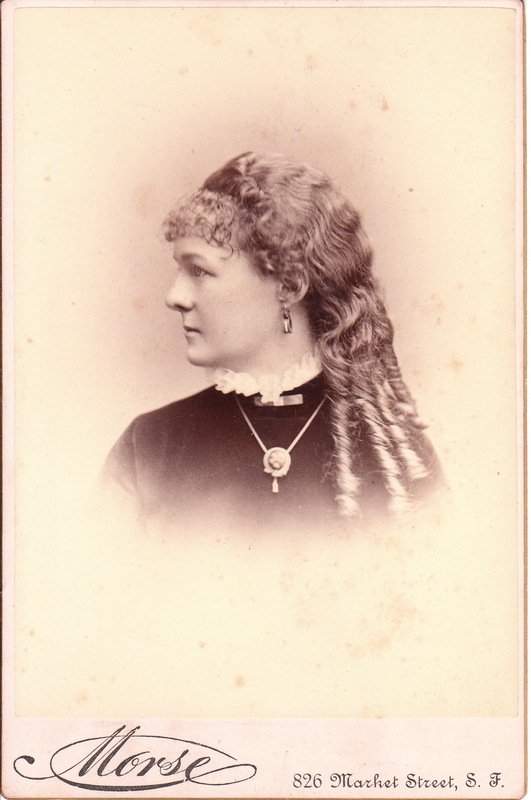 The number likely indicates the year that this portrait was taken. The reverse of the cabinet card has inscription with the name “Lloyd Brundage” and a note that states that Master Brundage was 21 months old at the time he was photographed. Research reveals that the subject of this image, Lloyd Jeffers Brundage was born in San Francisco on New Years day in 1887. He appears in many US censuses. In 1900 he was thirteen years old and living in Bridgeport, California with his father and mother. His father was named Marshal and was a 46 year-old laborer who was a native Canadian. Lloyd’s mother was named Nillie and she was 31 years old and a native Californian. Her maiden name was Smallwood. Lloyd had a five year-old sister named Delphine. The 1920 census found Lloyd living in Chico, California, with his wife Anna. He was employed as an “agriculturist”. Ten years later he was working as a mechanic in an industiral plant. He and his wife remained in Chico. The 1940 census discovers Lloyd working in a governmental general maintenance position. Lloyd died in 1955 in Butte, California. To learn more about the photographer, George Daniels Morse, and to see other examples of his work, click on the category “Photographer: Morse”. These two cabinet cards have some things in common. Each photograph features an attractive woman with bottle curls. In addition, each image was photographed by George Daniels Morse, whose studio was located in San Francisco, California. Note that these photographs were taken at different times; which is evident by the fact that the two portraits list the studio location at different addresses. To learn about Morse, and view other photographs by Morse, click on Cabinet Card Gallery’s category “Photographer: Morse”. Mr. George West poses for his photograph at the Morse studio in San Francisco, California. 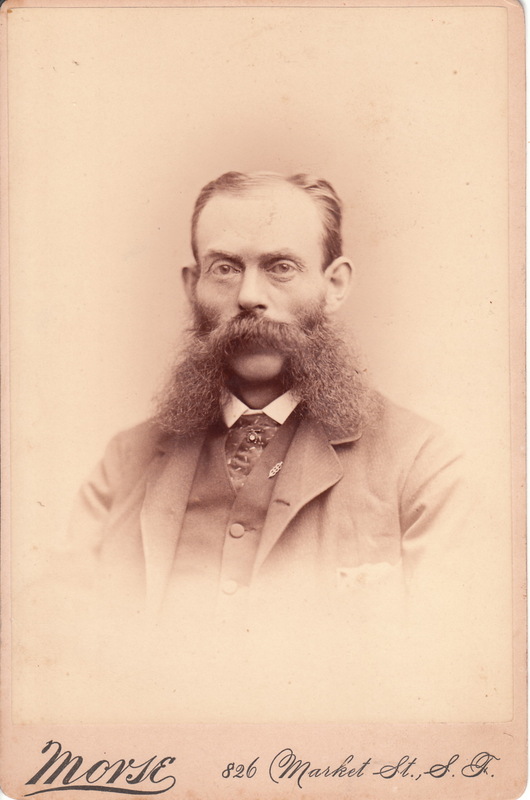 Mr. West is sporting an incredible mustache earning him a spot in this blog’s Mustache (Only the Best) category. Research reveals that the photographer of this cabinet card is George Daniels Morse (b1835-?). Morse was active in photography in Grenwich, New York; New York City; San Francisco (1862-1869 and 1896-1905); and Chicago. 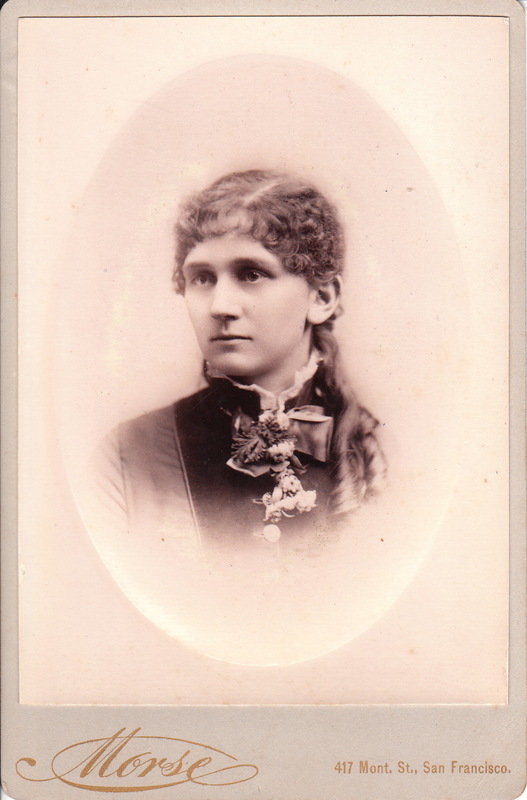 To view other photographs by Morse, click on Cabinet Card Gallery’s category “Photographer: Morse”.